Work: Charleston Council of Safety, 1775; Delegate to the Continental Congress, 1776. 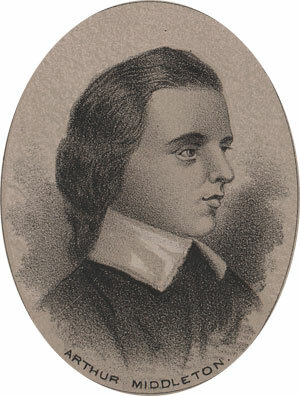 Arthur Middleton was born in South Carolina in 1742. He was educated in England and graduated a Cambridge in 1773. He was elected to the Council of Safety at Charleston in 1775, and in 1776 was a delegate to the Continental Congress. He was captured by the British when Charleston was overrun 1781, and held prisoner for more than a year. Most of his fortune was destroyed during the Revolution. He was engaged in politics until his death on the first of January, 1787.